"Die Cyborg ist eine überzeugte AnhängerIn von Partialität, Ironie, Intimität und Perversität. Sie ist oppositionell, utopisch und ohne jede Unschuld. Cyborgs sind nicht mehr durch die Polarität von öffentlich und privat strukturiert, Cyborgs definieren eine technologische Polis, die zum großen Teil auf auf einer Revolution der sozialen Beziehungen im oikos, dem Haushalt beruht." Emancipative action of autonomous ware subjects has got its pitfalls which will be addressed in this article. It will be examined how people relate to each other in groups and how they can act upon it. A theoretical model is introduced by which questions of solidarity, the political & the private and hierarchies & their economic conditions can be discussed and reflected. It shall be explained why the antifascist urban commune deems itself a cyborg society and what are the references to Haraway's Cyborg Manifesto. 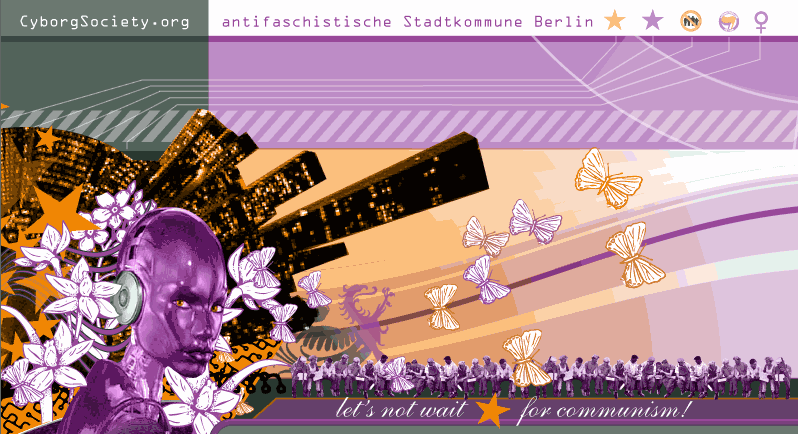 Franziska Roth, antifacist urban commune, Berlin - But I cannot imagine committing my life to one place and one group. I also have difficulties in believing that one singular group is economically and socially capable of mastering the adversities of life. Therefore the idea of a commune of several groups in several places materialised in our commune's founding group. a work by Engels (1884) - unfortunately it doesn't point out the functioning of the modern bourgeois family - but good to read anyway.